Scott M. Graffius, Founder and CEO of Exceptional PPM and PMO Solutions™, an Inc. Verified Business, is the author of the award-winning book, Agile Scrum: Your Quick Start Guide with Step-by-Step Instructions. A video minisode—related to Agile/Scrum—was published today. This is an update on the video. A new 1-minute video, Agile Has a Long and Colorful Heritage, was just published. It is live at https://vimeo.com/259429846 (and it can be played below). Scott M. Graffius, Founder and CEO of Exceptional PPM and PMO Solutions™, an Inc. Verified Business, is the author of the award-winning book, Agile Scrum: Your Quick Start Guide with Step-by-Step Instructions. A video minisode—containing excerpts from Agile Scrum—was published today. This is an update on the video. A new one-minute video, Product Increment and a Minimum Viable Product (MVP) Approach, is live at https://vimeo.com/258176585 (and it can be played below). Scott M. Graffius of Exceptional PPM and PMO Solutions™ had consulting engagements with a division of a global entertainment business. 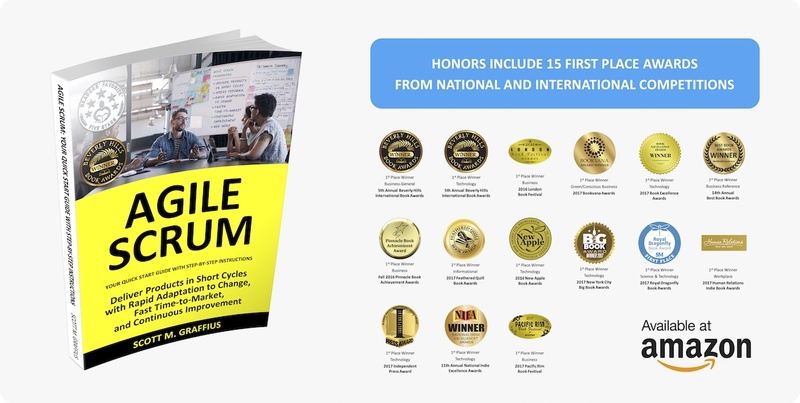 A fantastic agile transformation experience with that client was the inspiration for the book, Agile Scrum. This is an update on the book. This is an overview and quick update on Agile Scrum.